Despite the planned GASHU meeting cancellation which was necessary due to sociopolitical unrest in Haiti, close contact with our Haitian colleagues cleared the way for a “mini” F-URS stone workshop at our urology teaching center at Hospital St. Francois de Sales (HSFDS) in the center of Port-au-Prince. A number of other urologists and residents attended the lecture and observed cases. HSFDS staff anesthesia and nurses provided professional and competent assistance with rapid room turnover. In particular, Global Philanthropic Committee funded urology nurse, Japhare Joseph, was an invaluable leader. Upon arrival on March 23, we spent the afternoon at HSFDS assembling equipment and organizing supplies. These had been shipped last fall. We then reviewed patients and x-rays and set our OR schedule. Monday the workshop started with a lecture and discussion of the management of upper tract stones as well as indications for F-URS. We considered how F-URS would fit into the other treatment options offered in the stone center at HSFDS (semi-rigid ureteroscopy, ESWL and open surgery). The procedure was reviewed in detail and the ancillary equipment such as safety and working guide wires, access sheaths, baskets and stents were discussed. Complications and management of them were covered. F-URS in Haiti has been made possible with the recent development of disposable technology. Reusable scopes are prohibitively expensive and delicate with expensive repair costs. Disposable scopes which are discarded after a single use in the US can be processed and deliver several more cases. With several centers saving the scopes it is felt that we can keep the stone center at HSFDS supplied with adequate numbers. The remainder of Monday through Wednesday morning was spent doing cases including the first known F-URS case in the country. Given the instructional nature of the cases and the complexity (big, hard stones!) we managed 6 cases, including a patient with bilateral stones. With their previous experience in semi-rigid ureteroscopy, the Haitian urologists were quick to learn and performed exceptionally well. My opinion upon leaving was that Drs. Brutus, Dreux, Valme and Clervil had a solid understanding of the technique, potential pitfalls and better handle on patient selection. They also had a better appreciation of the importance of preoperative imaging, including CT scanning. With current internet connectivity and ability to share radiological images and live surgery, they have ongoing support from members of GASHU. 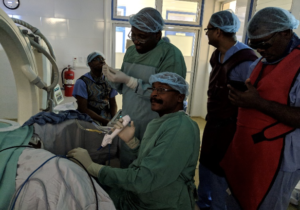 They are a solid core of individuals who work well together, share the vision of improved urological care in Haiti and are committed to teaching residents and the other urologists. 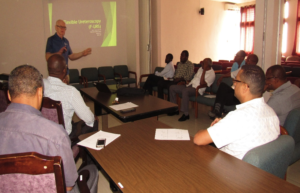 The trip concluded with discussions and planning for the support of the 2 urologists in Gonaives where a new Canadian-funded hospital has been built. They have no cystoscopic equipment and also need training as they have recently completed the urology residency program in Port-au-Prince. Dr. Clervil and the other urologists at the Partners in Health hospital in Mirebalais also are in need of cystoscopic instruments. We determined that shipping a set of ACMI instruments that has been donated by Dr. Ed Miedema, Colorado, to Dr. Clervil would be the best course of action and he will start training the young urologists in Gonaives. Once we acquire another set of instruments for Gonaives we can deliver and perform an endoscopic / TURP workshop. We also initiated plans for the next trip in June 2019 for a workshop at HSFDS on percutaneous nephrolithotomy (PCNL) with Drs. Bob Marcovich, Keegan Maxwell and Henri Lanctin as well as site visits to Gonaives and Mirebalais. On a personal note, I need to thank my Haitian friends and colleagues for their great concern and care during my 24 hour illness! 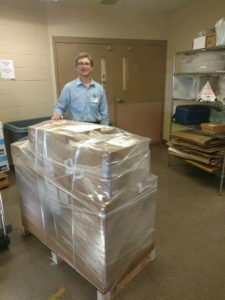 “David Weigel, director of Materials Management at Prairie Lakes Healthcare System with shipment of supplies for upcoming flexible ureteroscopy workshop at Hopital St. Francois de Sales in Haiti. David was instrumental in preparing the supplies for shipment and utilizing his contacts with Old Dominion to secure charity rates for trucking the pallet to Food For The Poor in Florida. The shipment will arrive in Port-au-Prince in time for the training session. 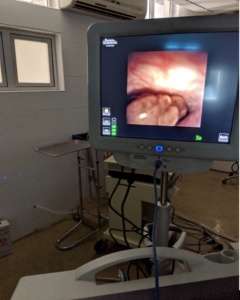 Preparation for our trip began many weeks before we arrived and included a Zoom video conference with Dr. Youry Dreux and other Haitian attending urologists and Haitian residents. The conference included a short didactic session reviewing the management of Pelvic Fracture Urethral Injuries (PFUD) and a presentation of 7 cases. The cases were presented by Dr. Youry Dreux and included relevant history, imaging and planned management. This conference and the presentation of cases with management plan represents a significant advance in the knowledge base of our Haitian colleagues and is a testament to the efforts of the IVUmed and Project Haiti teams that have built capacity within the country of Haiti. The 6 members of the team arrived by air on March 30 and checked in to Le Plaza Hotel, near Hopital St. Francois de Sales (HSFDS) in downtown Port-au-Prince. Claudie Williams arrives on April 1st. A team dinner/meeting was held that evening. The next day we visited HSFDS, toured the facility and OR’s. 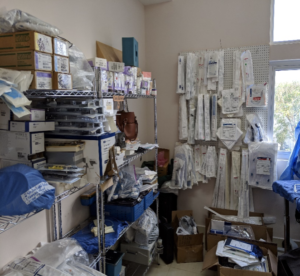 Time was spent organizing equipment, meeting staff and verifying that all anesthesia equipment was operational and necessary anesthesia medication was available. Drs. Burks, Gallegos and Warner working with Dr. Sean Elliot’s fellow Dr. Joseph Pariser performed, taught and proctored a total of 11 urethral reconstruction procedures. Three of the procedures were repeat procedures. Two excision and primary anastomosis procedures were performed for short mid-bulbar strictures. Four PFUD repairs were performed and 2 first stage Johansen urethroplasties were performed. Buccal mucosal graft (BMG) was harvested in 4 cases and this is a skill that Dr. Lemause and Dr. Kedex are developing. One of our more complex cases was a patient with intersex disorder who had a urethra cutaneous fistula from prior urethral surgery and was currently voiding from a scrotal urethrostomy with significant penile chordee. After reviewing the case and available imaging we performed a closure of his urethral fistula and first stage Johansen urethroplasty with BMG for advancement of his urethral out to the distal phallus as well as correction of his chordee. On our last day of the work shop a patient with a very complex pelvic fracture (significantly malpostioned pubic bone from non-operative management of his pelvic fracture) had an attempted PFUD repair that was aborted because of concern for failure to progress and an inability to identify the proximal prostatic urethra despite aggressive resection of the boney pelvis. There was also concern for a possible rectal injury if we proceeded to remove additional scar and bone. After much discussion Dr. Warner and I made the decision to abort the case out of concern for the patient. There were no complications encountered at the time of team departure from Haiti. Average estimated blood loss was 200 cc. Detailed postoperative instructions were left with Dr. Dreux regarding catheter management and recovery. With these cases, this team has now taught and performed 79 urethral stricture cases in Haiti. Haitian urologist in attendance were Drs. Youry Dreux, Joe Kedex (junior attending), Billy Lemause (senior resident) and Bernard Brutus. Each of our cases had a Haitian urologist scrubbed in and participating in key portions of the cases such as urethral dissection, excision of scar associated with PFUD injury, urethral anastomosis and harvest of buccal graft. Dr. Dreux’s operative skills and clinical judgement have progressed such that I would consider him at the level of a newly fellowship trained reconstructive urologist. He reports doing 2-3 urethral reconstructive cases a month at HSFDS and other hospitals in Port-au-Prince. He is also receiving referrals from other urologists throughout the country and makes every effort to include the referring urologist in the management plan and the eventual operation. While at HSFDS our team verified that the fluoroscopy machine was in working order and that the ultrasonic lithotriptor was operational. Over all the facilities at HSFDS were adequate and safe for performing the complex and routine urethral reconstruction. Anesthesia staff and residents were available and helpful. The PACU staff could use some development in standardized postoperative recovery protocols. One of the highlights of working at HSFDS is interacting with the Urology nurse Japhare Joseph. She has done an excellent job at organizing the urology equipment and supplies and has developed significant expertise in handling and maintaining the urology equipment. She is a true asset to the Urology Department at HSFDS. In summary we had a very productive and educational trip. Verbal feedback from Drs. Dreux, Kedex and Lemause expressed appreciation of the didactic teaching and proctored surgical procedures. Members of our team have expressed to me that they found working at HSFDS enjoyable and interacting with our Haitian colleagues as a highlight of the trip. We hope that our efforts will continue yearly. We are looking forward to updates regarding the patients’ recovery and encouraged our Haitian colleagues to reach out to us by phone or email for any concerns. On behalf of the attendees, I would like to thank each of you for making yourself available to come down in Haiti to help us out with our patients suffering with urethral stricture. I would like to let you know how grateful and joyful we are because we spent this whole week with you guys and, as usual ,the ambiance was very good ,you were teaching us with patience ,enthusiasm ,wisdom and humility . We do hope you will make it safely back home and may the Lord keep protecting your family and preserving you life . Once again thank you so much ,guys ,please feel free to come back any time you will be always welcome.